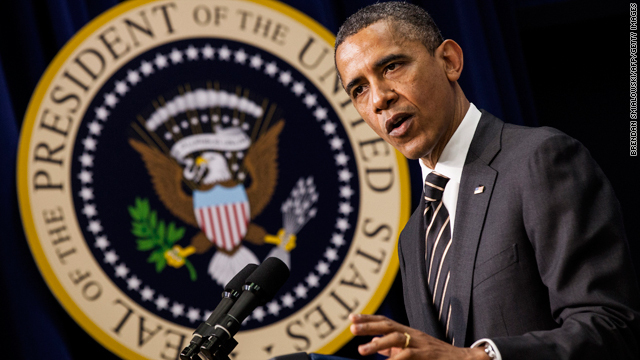 Why does President Obama continue to refuse to enforce the nation's immigration laws? Just in time for the election and courting the Hispanic vote, the Obama Administration is out with another way to ignore the nation's immigration laws. The Department of Homeland Security now wants to issue so-called "unlawful presence waivers." These are meant for illegal aliens who are relatives of U.S. citizens. The way the law works now, these aliens must return to their native country and request a waiver of inadmissibility. But the federal government says the proposed changes would "significantly reduce" the length of time U.S. citizens are separated from their immediate relatives. Critics are slamming the proposal, calling it "stealth amnesty" and another attempt at backdoor amnesty. Which is exactly what it is. Mr. Obama promised federal immigration reform when he was running for president in 2008, but it never happened. Instead of reform it looks more like bending of the rules for some of the estimated 12 million illegal aliens. Gee, just in time for the president's reelection campaign. Last year the administration started cutting back on deportations of illegal aliens without criminal records - and reviewing all existing cases. That resulted in a big drop in deportations even though one study shows that immigrants with criminal records don't necessarily make up a larger portion of those deported. President Obama told Univision in February that the administration is re-emphasizing its focus "on criminals and at the borders" and not on "hard-working families." All designed to get enough Hispanic votes to win a second term. Here’s my question to you: Why does President Obama continue to refuse to enforce the nation's immigration laws? Illegal aliens leaving U.S., returning to Mexico for better life? Illegal aliens are leaving the United States and returning to Mexico in search of a better life. You heard that right. One Mexican official tells the Sacramento Bee that Mexico has "become a middle class country" where it's now easier to buy homes on credit, get higher education and find a job." Not so here in the U.S. where the employment picture remains grim. Just today came announcements from Cisco and Goldman Sachs that they're cutting thousands of jobs. Plus - a report from payroll processor ADP shows that although the private sector added jobs in July, growth is below what's needed for a steady recovery. Meanwhile - As we wait for the monthly jobs report Friday, consider this: Mexico's unemployment rate is 4.9%... compared to 9.2% in the U.S. You do the math. It's estimated that about 300,000 illegal aliens have left California alone since 2008. Experts say the weaker U.S. economy along with rising deportations and tougher border enforcement means fewer illegal aliens. But - there have also been significant improvements in Mexico's society. Its economy is growing at 4-5% and, according to the UN, Mexico's average standard of living - which includes things like health, education and per capita income - is higher than in Russia, China and India. Turns out Mexicans might just have better luck of achieving the American Dream south of the border. Here’s my question to you: What does it say that illegal aliens are leaving the U.S. and returning to Mexico in search of a better life? 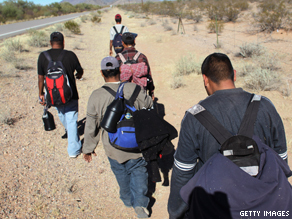 Should Arizona be allowed to enforce its own immigration law? You can tell there's an election coming. 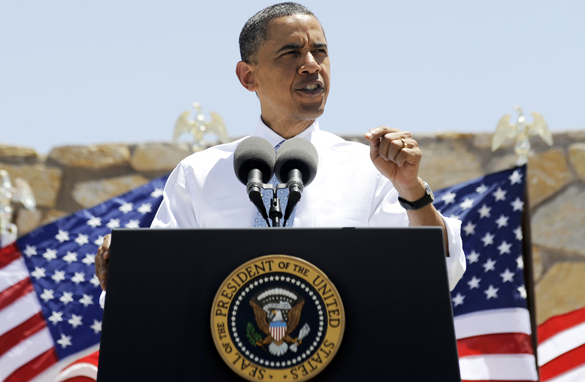 President Obama traveled to El Paso, Texas, to deliver a speech this afternoon on immigration reform. He talked about the economic benefits of immigration overhaul and about increasing the number of border guards from the days of the Bush Administration. Of course, he stopped short of talking specific immigration legislation. Because of the federal government's refusal to secure this nation's borders, many states have taken it upon themselves to pass their own legislation. 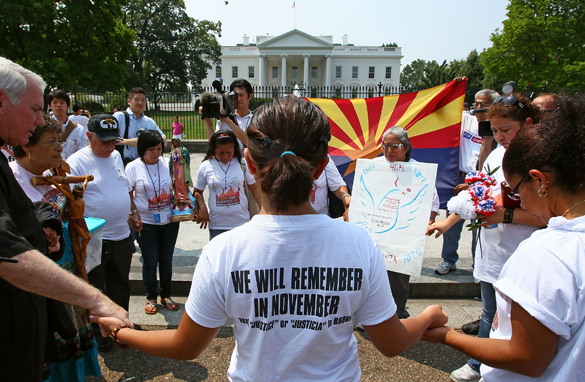 Arizona passed a controversial illegal immigration law last year. It requires police officers to investigate the immigration status of any person they stop who they think may be an illegal immigrant. The law also makes it a crime to not carry immigration paperwork while in the state. You know, just like you're required to carry a driver's license if you drive a car. The U.S. Department of Justice sued to block the Arizona law and won. A three-judge panel of the U.S. 9th Circuit Court of Appeals found the law to be unconstitutional. But Governor Jan Brewer said yesterday that Arizona will appeal directly to the U.S. Supreme Court. The Supreme Court is already set to rule in a case on another Arizona immigration law in the coming weeks, one that dissolves businesses that repeatedly knowingly hire illegal aliens. If it wins the case, Arizona will need some help enforcing this new law on its own. Which is why it is asking for public donations to fund its legal defense of the law and to construct a fence between Arizona and Mexico. And it's getting them. So far, the state says the response has been very positive. The people of Arizona are tired of waiting for Washington to enforce the federal immigration laws already on the books. 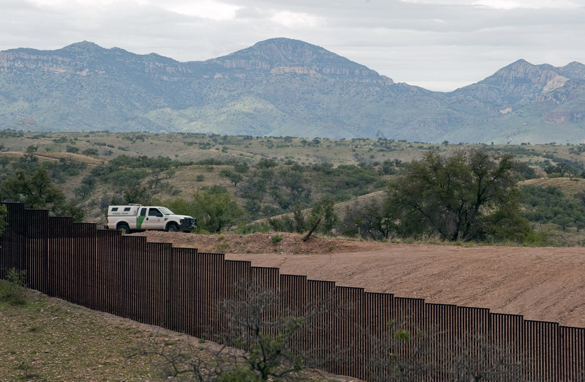 Here’s my question to you: Should Arizona be allowed to enforce its own immigration law? 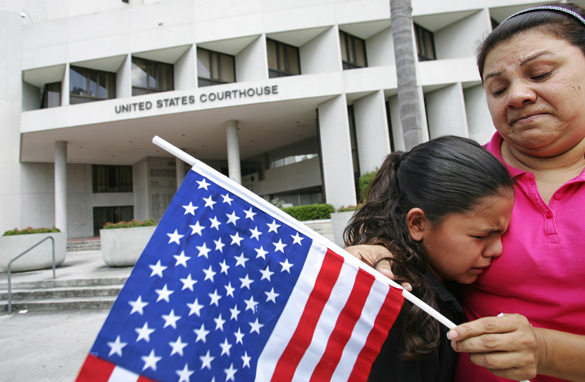 States deny citizenship to children born of illegal immigrants? 14 states are considering passing laws that would deny citizenship to children born of illegal immigrants in the United States. Arizona - ever at the front of the immigration debate - could take the first step when it comes to the issue of "birthright citizenship." Arizona lawmakers plan to introduce model legislation in Washington tomorrow that would force the Supreme Court to weigh in on the issue. Lawmakers from more than a dozen other states plan to be there too - that includes everywhere from other border states like Texas to Utah, Oklahoma, Michigan, Delaware and Pennsylvania. This all goes back to the 14th Amendment - which states that all persons "born or naturalized" in the United States are citizens of the U.S. The law was initially meant to give citizenship to freed slaves. Those behind this new push say it wasn't meant to apply to children of foreigners. They say illegal immigrants and their children are draining taxpayer-funded services, and that they're attracting more illegal aliens to this country. Critics of an effort to end birthright citizenship say these attempts to take on the 14th Amendment could cost big bucks in legal challenges. They also say the issue is a federal one. And we all know how serious the federal government is when it comes to dealing with illegal immigration. Here’s my question to you: Should states deny citizenship to children born of illegal immigrants? 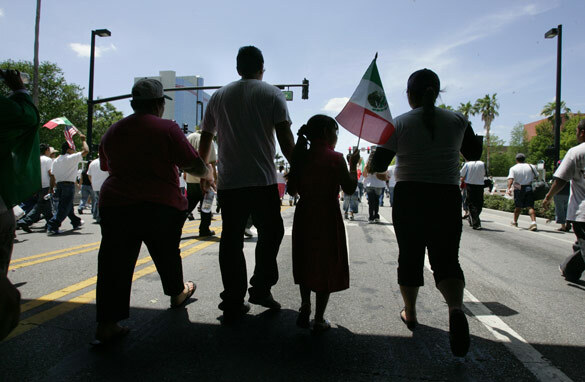 Path to citizenship for illegal aliens who came here as children? Looks like it may only be a dream after all. Senate Democrats voted to pull the so-called "DREAM Act" from consideration today. They don't have enough votes to pass it. DREAM is an acronym for "Development, Relief and Education for Alien Minors Act" and would have offered a path to citizenship for illegal immigrants who came to the U.S. as children. The measure passed the House yesterday, but unless the Senate acts, it will die with the lame-duck Congress. The DREAM Act would apply to illegal aliens who came here when they were younger than 16, have lived in the U.S. for at least five years, received a high school diploma or G-E-D and shown "good moral character." They would be given a six-year-conditional status before the next stage, where they would be required to go to college or serve in the military for at least two years and pass criminal background checks. Those who don't fulfill these requirements would lose their legal status and could be deported. Supporters say the measure offers legal standing to youngsters brought here who have bettered themselves and served our country. Critics say it's nothing more than backdoor amnesty for as many as two million illegal aliens. They also say the bill allows illegal aliens to get in-state tuition at public universities and is a "magnet for fraud." Here's my question to you: Should illegal aliens who came here as children be given a path to citizenship? Growing disconnect between states and federal government? 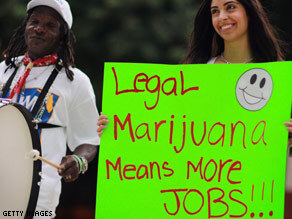 The legalization of marijuana, immigration reform and health care. These are just three hot-button examples of how the states and the federal government are increasingly out-of-step with each other. Starting with California, the Justice Department is vowing to keep prosecuting people who possess marijuana there - even if voters approve a ballot measure that would legalize recreational use of the drug. Attorney General Eric Holder says the administration "strongly opposes" Proposition 19 and will "vigorously enforce" federal drug laws should the measure pass. Whether or not you approve of marijuana, California is bankrupt and in desperate need of money. Taxing pot might be a way to raise some cash. Meanwhile - the federal government is going after states like Arizona, which are trying to do something about illegal immigration since the federal laws go all but unenforced. The Obama administration is suing Arizona, claiming the state's immigration law is unconstitutional. A federal judge has put some of the most controversial parts of the law on hold... but Arizona's governor Jan Brewer is vowing to take her state's case all the way to the Supreme Court. And then there's President Obama's signature issue of health care reform. It's been the law of the land for several months, yet dozens of states are now challenging it. A federal judge has ruled that a lawsuit brought by 20 of these states can move forward. He says the states can challenge the constitutionality of the law's requirement for all Americans to buy health insurance. Here’s my question to you: Why does there seem to be a growing disconnect between the states and the federal government? How many lawsuits should fed. govt. file against Arizona over immigration issues? The federal government is filing yet another lawsuit against Arizona when it comes to the heated issue of immigration. This time the Justice Department is going after a Phoenix-area community college system. The feds say the school discriminated against almost 250 non-citizens by making them show extra immigration paperwork before being hired. Officials say this violates an anti-discrimination provision in a federal law. This latest lawsuit comes less than two months after the Justice Department sued Arizona over its tough new immigration law. A federal judge has put on hold the most controversial parts of that law - including the requirement for police to check the immigration status of anyone they stop if they think that person may be in the country illegally. In the meantime, the State Department has decided to include Arizona's new law in a human rights report to the United Nations. The U.S. included its legal challenge to the Arizona law as one way the federal government is protecting human rights. Arizona Governor Jan Brewer was outraged - and rightfully so. She's demanding the reference be dropped. Governor Brewer says it's "downright offensive" that a state law would be included in the report to the U.N.
And there's more: The Justice Department is also investigating Sheriff Joe Arpaio in Maricopa County, Arizona for possible civil rights abuses. Sheriff Arpaio is known for being tough on immigration enforcement. Unlike our federal government. Here’s my question to you: How many lawsuits should the federal government file against Arizona over immigration issues? What if 22 states considering immigration laws like Arizona's? One day we may look back on Arizona as the state that led the way when it comes to doing something about the illegal immigration crisis. 22 states are now considering immigration laws like the one passed in Arizona, according to a group called Americans for Legal Immigration. These include another border state, Texas, along with northern states like Pennsylvania, Ohio, Michigan and New Jersey. Some states - like Rhode Island and Colorado - are sending lawmakers to Arizona to figure out how to best craft their own immigration laws. All this is happening, despite the fact that a federal judge threw out key parts of Arizona's law - including requiring police to check the immigration status of anyone stopped for another reason. That ruling is now under appeal. 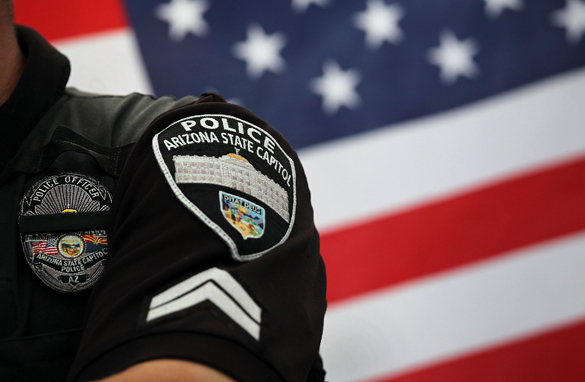 Polls show a majority of Americans support Arizona's law. They want something done. Meanwhile - there are signs that the violence from Mexico's drug wars is spilling into the U.S.
A shootout between drug traffickers and Mexican authorities in Juarez injured three police officers and left one gunman dead. 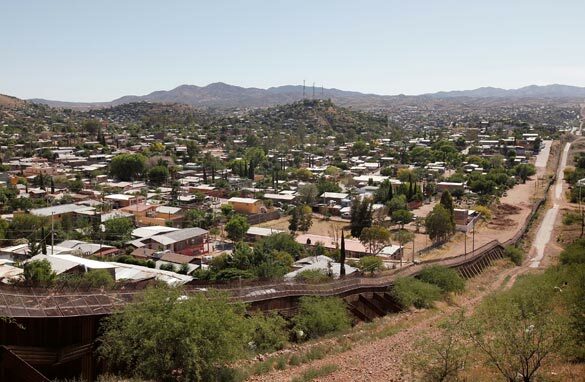 Juarez is only 30 yards from the border at El Paso, Texas - and has become one of the deadliest cities in the world - more than 1,800 people have been killed there this year. Authorities say a bullet from the shootout may have struck a building at the University of Texas. This comes less than two months after several bullets from a deadly shootout in Juarez hit the El Paso City Hall. It's no wonder Texas Governor Rick Perry keeps pleading for more National Guard troops . Here’s my question to you: What does it say if 22 states are considering immigration legislation like Arizona’s? Fed. govt. suing Arizona instead of enforcing its own immigration laws? It's unlikely the federal government will do anything meaningful anytime soon about immigration; but that hasn't stopped them from suing Arizona for actually tackling this crisis. The Justice Department lawsuit charges that the Arizona law cracking down on illegal immigrants is unconstitutional. The federal government says that the state's immigration law conflicts with the federal law - that it would disrupt immigration enforcement and violate the rights of innocent Americans and legal residents. Arizona's governor, Jan Brewer, calls the lawsuit "nothing more than a massive waste of taxpayer funds," saying the money could be better used against violent Mexican drug cartels. And she has a point. Meanwhile despite President Obama's repeated calls for bipartisan immigration reform, senior Democrats say they see virtually no chance of Congress taking up such a bill before the midterm elections. No surprise here - wouldn't want to toss around a political hot potato and vote on tough issues before an election. And - while the federal government twiddles its thumbs, the cost keeps piling up on us, the taxpayers. A new study claims that harboring an estimated 13 million illegal aliens is costing $113 billion a year. That translates to about $1,100 for every "native headed" household in America. The report - conducted by an outfit called the Federation for American Immigration Reform - shows the most money goes toward schooling the children of illegal aliens. Critics describe the group - which aims to end almost all immigration to the U.S. - as "extremist" and they say the report is inaccurate. Here’s my question to you: Why is the federal government suing Arizona instead of enforcing its own laws against illegal immigration?